The local Nakhimov Naval School will open 1st September 2017 and be aimed at kids from the Russian North, Deputy Minister Timur Ivanov said as he visited alternative construction sites in Murmansk. «The time schedule has been given, the Russian President recently announced that the first nakhmovtsy [students] are to start up classes on 1st September 2017, and this will happen», Ivanov underlined during his visit. The school will include a teaching complex, a marina, a sport and stadium complex, cantina, dormitory and a parade ground, a press release from the Navy informs. «Kids from all over Northwest Russia can enroll in the school, among them kids of the servicemen working in the Arctic zone and on the islands», Ivanov said. Four alternative construction sites were visited. A prerequisite is that the school is situated by the sea and that communications and infrastructure is easily available. This must become a point for growth and development in Murmansk, the Navy underlines. The new complex will be the first of the kind built since the original Nakhimov School was established in St. Petersburg in 1944. There is also a Nakhimov School in Sevastopol, the Crimean Navy town. Education is 7-year long and starts from the 5th grade (12 years age). Students live on campus and have a six-day study week, the school informs on its website. «It will be a school for the whole Northern Fleet, for all our bases», Fleet Head Commander Nikolay Yevmenov underlines. It will include also a class for girls. The Nakhimov School is not the only new school now established by the Ministry of Defense. Last week, Deputy Minister Ivanov also visited Petrozavodsk, Republic of Karelia, where a new Presidential Cadet School with place for 360 students will be built. Similar schools are being built all over the country. 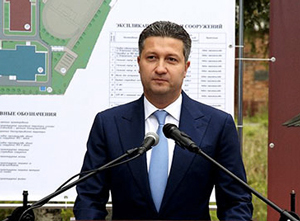 It is a strategic priority task for the Ministry, Timur Ivanov underlines.